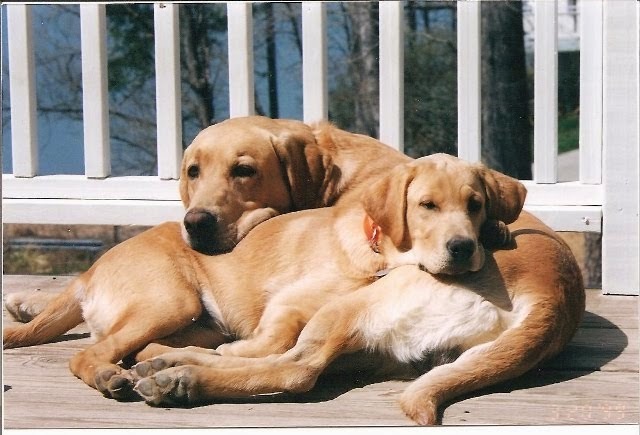 We had a yellow lab for 16 years and when we lost her we didn't think we could ever replace he. She was an excellent retriever, obedient and had great temperament. It took us about a year before we decided it was time to try and get a new buddy for us. We had known Jean personally for years so when we finally decided to look for a lab the first person we thought of was Jean. We knew she was honest and bred excellent labs. We also knew she would she do her best to find a replacement as close to the type lab we had before. We wanted a female but all she had at the time we called were males. She socializes the pups very early and told us I have a male that would be perfect for you and Debbie. She was right. Buckshot is 3 yrs old now, perfect confirmation, muscled up 83 pds. (no fat) excellent retriever, easily trained, and just as she had told us his temperment has been as good as our old female. We have a lot of duck hunters when they see Buckshot they want to know where did we get such a great dog..............Hat Creek Farm!! !